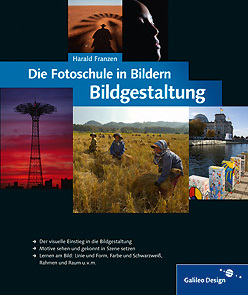 On more than 300 pages, Die Fotoschule in Bildern. Bildgestaltung (in German) explains and illustrates the principles of photographic composition and related topics like lines, shapes, framing and space, as well as the conscious use of light, color, time and movement as well as black and white. The book also addresses the question of finding subjects and approaches to photographing them. It contains more than 300 photographs and many stories and helpful tips about the daily work of a photojournalist. 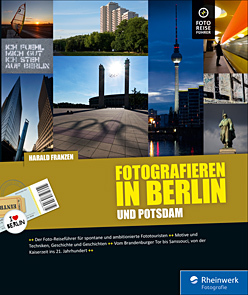 “Photo text book and Berlin travel guide all in one” is how one reader described my book Fotografieren in Berlin und Potsdam in his review and that sums it up pretty well. On almost 400 pages, the reader-photographer discovers the famous and the more hidden fascinating places in Germany’s capital. Be it at Alexanderplatz, in the Korean garden in Marzahn, the Chapel of Reconciliation in the former death strip of the Berlin Wall or the crazy-looking subway stations of the U7, there is always something new to discover and capture photographically. Aside from stories and history there are practical photographic tips and many photos to inspire readers to embark on their very own exploration of historic, modern, crazy, green, dilapidated or simply fun Berlin.